After seven years in planning, development, and construction, Harrison Park is finally ready for its official debut. 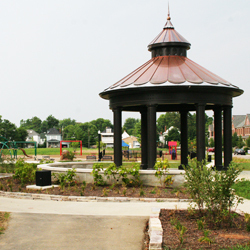 The Harrison West Society is happy to invite the community to a grand opening celebration on Thursday, September 1 at 4:45 p.m. at the gorgeous new Harrison Park gazebo at the corner of West First Avenue and Harrison Park Place. 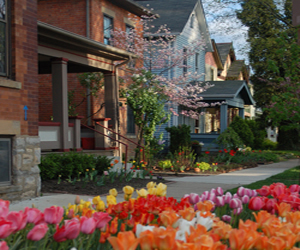 Guests of honor include Mayor Michael B. Coleman; Alan McKnight, Director of Columbus Recreation and Parks; Rob Harris, President of the Harrison West Society; and Mark Wagenbrenner, President of Wagenbrenner Development. Following the ceremony, a community potluck will be held at the Harrison Park Condo Community Center. If you are a great baker, whip up your best a dessert and enter it into our “Best Dessert Contest!” Jeni’s will provide ice cream, Wagenbrenner Development will provide City Barbecue, and the River Ratz will provide music. Additional games and activities are planned in the park for adults and children including face painting and other entertainments for kids by area Girl Scouts. If you plan to attend, please RSVP here so we can estimate how much food to order. We hope to see you at our new park on September 1st!